In Waterloo-City, City-Waterloo, Leanne Shapton creates an authorly and artistic response to the Waterloo and City line’s particular length and those who travel on it. Shapton observes the particularities of the line’s rush-hour passengers and imagines a number of their interior monologs, in both verbal and visual detail. The variety of commuters ruminations and obsessions result in a detailed and illustrated breakdown of the line’s distance and time – its brevity, its passage between only two stations, its existence as almost primarily a shuttle for office workers going between their homes and the business district of the City. 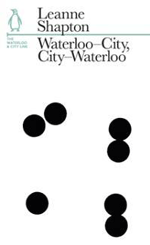 The layout of the book reflects the two stops on the line, one half of the book representing the Waterloo-City outgoing journey, and the second half, the City-Waterloo return voyage. Leanne Shapton is an artist, illustrator, and writer who was born in Toronto and lives in New York. She is the author of Important Artifacts and Personal Property from the Collection of Lenore Doolan and Harold Morris, Including Books, Street Fashion, and Jewelry. Her latest book, Swimming Studies, is published July 2012.